Looking for inspiration for our 27 Days of Open Submissions, which we’re running in association with Cornerstones? Author GJ Minett describes how he came up with the idea for his gripping debut novel, The Hidden Legacy. ‘I trust you will be sitting down when you read this’ – the simple opening line of a life-changing email from my agent, telling me ostensibly that I had a two-book deal with Twenty7 but in reality telling me so much more than that. And on Friday 13th too – you couldn’t make it up! I’d had plenty of time to prepare myself for a moment such as this, more years than I’d care to recall of hurling myself against doors that creaked and groaned but somehow refused to open. And yet, once the initial mad scenes of celebration and frantic phone calls to friends and family were out of the way and I had time to sit down and reflect on things, I was surprised to realise that exhilaration was having to share top billing with other emotions. Prominent among these was a huge sense of relief at no longer needing to feel like some sort of fraud whenever I talked about my writing. One of the hardest things about being an unpublished author, at least in my experience, is convincing yourself that you are a writer. I’d been trotting out the same old answer for years whenever anyone asked what I did for a living: teacher, timetabler, data analyst. If writing ever got a mention it was way down the list, usually once the conversation turned to hobbies, and I always found it hard to talk about any literary aspirations I might have without seeking out that knowing look in their eyes. It was probably a reflection of my own insecurities but the feeling was always there that others would be bound to see this as some sort of pose assumed by a wannabe who never would be, and the realisation that I’d no longer need to equivocate over such things brought with it a warm glow that I’ve carried around with me ever since. Yes, it’s exciting to have broken through. Yes, it’s nice to be talking with publishers about editing and publicity and book covers and blurbs and shout lines instead of emailing to check whether my manuscript has made it off the slush pile. It’s wonderful to have entered this new world where I have so much to learn. But more than anything else, it’s just so damned liberating to be able to say ‘I’m a writer’ and not squirm inside. I remember so many panels I listened to, so many talks by authors, publishers, agents, and whenever they were asked by aspiring writers for advice on how to get published, there was always someone who suggested that the answer was to keep going, to accept rejections as a necessary evil and take the positives out of them. If you want it badly enough, the message seemed to be, you’ll get there eventually. And I found myself wanting to scream at them, because all I inferred from this was if you don’t get there, it’s because you don’t want it enough. And I wanted it so badly – I really did. But they were right. I was a long way short of doing everything I could to make the breakthrough and it wasn’t until I acknowledged this and gave my writing the level of priority it required that things started to move. I didn’t get a book deal by opening an email from my agent. That was the final stage of a planned route which I followed faithfully. I studied for a part-time MA in Creative Writing at the University of Chichester where I discovered that I wasn’t even close to the finished article I’d always assumed I was. Then I entered competitions, making use of the short stories I’d written for the course, and set about putting together a CV that might persuade a busy agent to break off from her/his frantic schedule and take a look at my opening chapter. I may not have bought into the cliché of papering my walls with rejection slips but I did study every letter carefully in an attempt to identify criticisms (positive as well as negative) that were common to most. Once I started getting longlisted, then shortlisted and finally winning competitions, I knew I was ready to research agents who specialised in what I wanted to write. And once I found the right agent . . . It worked for me but it’s certainly not a one-size-fits-all scenario and I wouldn’t dream of suggesting everyone should do the same. All aspiring writers need to find their own way which suits them as individuals. I always swore that if I ever made the breakthrough I would never patronise others who may be only days away from following me. All I would say is that at 5.30 on Friday 13th I was a person who writes. At 5.35 I was an author. But it’s amazing how much needs to go into those five minutes to turn you into an overnight success. And if I could urge any writer to take one thing from my own experience, it would be this. If you enjoy writing, whether it’s for your own amusement or to entertain or impress others, you are a writer. If you dabble in the occasional short story or are deep into planning a 100,000 word novel, in those moments when you shut yourself away with pen in hand or laptop at the ready . . . you are a writer. Say it – I’m a writer. You need to tell yourself that as often as you can because it’s what makes the difference. And if you don’t believe it, why should anyone else? Visiting our office? 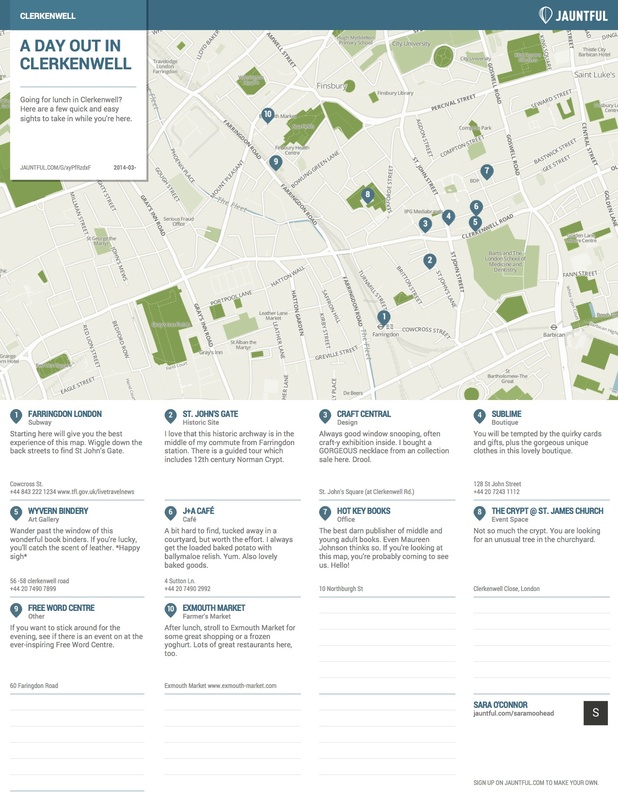 Discover Clerkenwell by using our Jauntful map.